In the comic novel Salmon Fishing in the Yemen, a western fish expert teams up with a sheikh to bring salmon fishing to the mountains of the south-western Arabian peninsula. On the other side of Arabia, life is not quite imitating art – but a United Arab Emirates-German joint venture is building a vast sturgeon fish farm in Abu Dhabi. While the novel’s madcap idea ended in disaster, the Abu Dhabi initiative aims to provide a lucrative export opportunity for the UAE as it seeks to diversify away from oil production, while also helping safeguard the future of the endangered species. 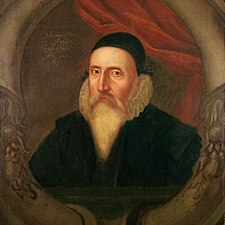 As we watch hell freeze over, we might send magical birthday greetings to John Dee, the mathematician, astronomer, and geographer who was a consultant to Elizabeth I– and who was born on this date in 1527. Dee was a translator of Euclid, and a friend of both Gerardus Mercator and Tycho Brahe; he revolutionized navigation by applying geometry; and he coined the word “Brittannia” and the phrase “British Empire.” He had a tremendous impact on architecture and theater– and was the model for Shakespeare’s Prospero. “So how come such a significant philosopher– one of very few in a country then considered an intellectual backwater– barely features in British history books? Because of his notorious links with magic” (observed BBC’s Discover). Dee was also involved (most heavily, toward the end of his life) in the Hermetic Arts: alchemy, astrology, divination, Hermetic philosophy and Rosicrucianism (the Protestant answer to the Jesuits, which Dee founded). Perhaps most (in)famously, Dee put a hex on the Spanish Armada, a spell widely credited at the time for the misfortunes that befell the Iberian fleet (as readers may recall).